Need a quick idea to dress up a mediocre wedding? Balloon decorations are just what you need. These do-it-yourself ideas are not only low-cost but also lovely additions to a wedding ceremony or reception. 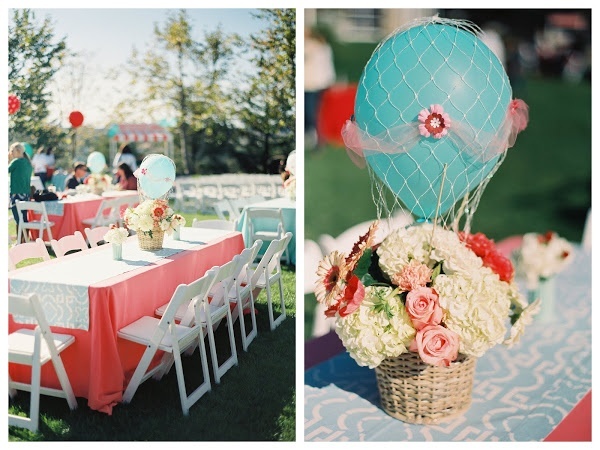 Adding balloon decorations to your wedding is a smart way to be creative and save money. 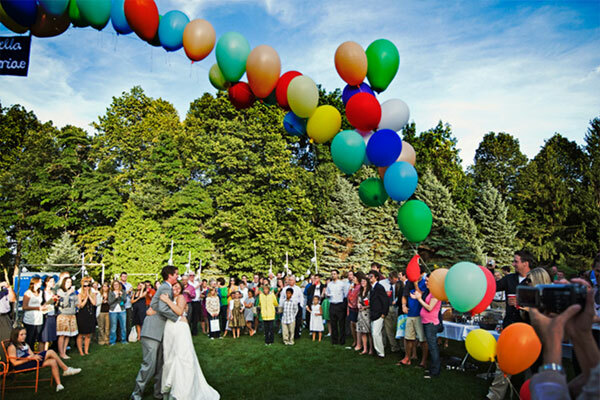 The balloon arch is a perfect way to add flair to your celebration. The easiest way to construct the piece is to get a pre-built wedding arch made of white metal. If a wedding arch is not available, you can build an arch using strong bendable metal wire. Just make sure it is sturdy enough to stand on its own. After positioning the arch, simply attach full balloons onto the arch using wire ties or string. Wrap the tie around the base of the balloon and then onto the arch. It is best to start at the top and work your way down both sides evenly to crate a uniform look. This can be done with multicolored balloons or balloons of one shade. Balloons should not be filled with helium however. The more balloons you can attach, the better the piece will turn out. Also, this is a piece that must be constructed at the site where it will be used. Balloon arches last approximately twelve hours, so plan its construction carefully. The completed arch can be used in several places. Some brides choose to place the arch outside the entrance to the ceremony. This allows guest to walk through the arch as well as the bride and her attendants. Other brides choose to use the arch as a ceremony highlight. They prefer to place it in the ceremony area so they can stand under it as they are saying their vows. Lastly, many brides feel this decoration is better suited for the reception area and use it to decorate for the after-ceremony event. 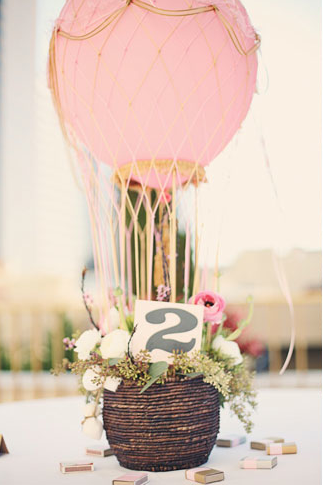 One of the best places brides can use wedding balloon decorations is on reception tables. 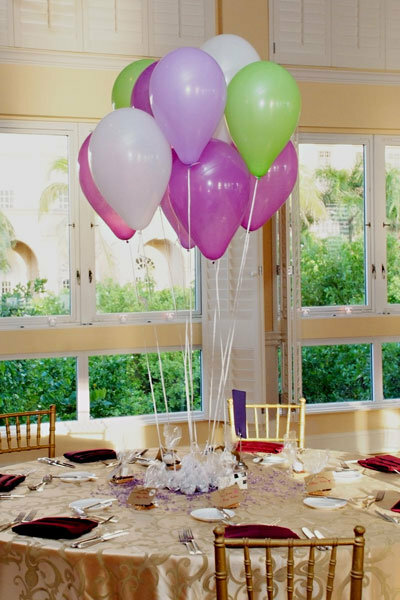 To make a creative balloon centerpiece, you will need white paper lunch sacks, sand, pretty string, helium, and balloons in coordinating reception colors. Take a paper sack and fill it will two cups of sand. Fill three balloons with helium and tie them off with long strings. Then, bunch up the top of the sack and tie the balloons around it to secure them. Place the sack in the middle of the table and you have an easy centerpiece. It is best to cut the strings of the three balloons differently to allow them to be different heights when arranged. You can also curl excess ribbon or string to make it more decorative. For extra beauty, brides can stuff the bags with decorative tissue paper after adding the sand. When the balloons are attached the tissue paper can stick out of the top for a more polished look.